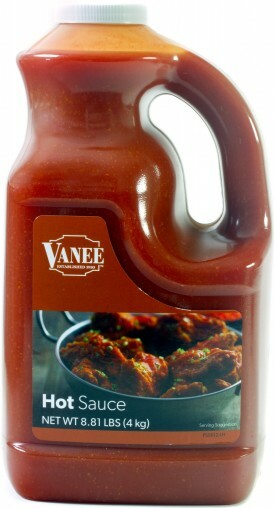 Vanee Hot Sauce is a moderately spicey, vinegar-backed sauce that combines heat with a well-balanced flavor. Great for making signature wings, as a condiment, or as an ingredient for adding heat to existing recipes. Vanee Hot Sauce has aged cayenne pepper as its first ingredient, and comes conveniently packed in gallon, pour-friendly jugs; simply shake, pour, and serve. Each one gallon jug yields 800 single teaspoon servings, for 3,200 servings per case. Great for making signature wings, as a condiment, as a recipe ingredient for adding heat, or for wraps and salads. Aged Cayenne Pepper Puree (Salt, Acetic Acid), Water, Vinegar, Xanthan Gum.